If you're thinking about making your own DIY wedding cake - or perhaps one for a friend - it's always great to find some inspiration. Yet when you search the internet, most cakes you'll see are made by professionals in a bakery. Of course those are beautiful - their makers have tons of experience and time to focus. Yet if you don't want your labor of love to end up on Cake Wrecks, it's better to stick to a simple and realistic project. So we've rounded up real examples of DIY wedding cakes with tips about how they prepared, what they wish they'd done differently, and most importantly, pictures of how the ordeal turned out. This first example is one I made many years ago, giving you an example of what an amateur baker could accomplish, along with tips about how to give a tiered cake structure so it doesn't collapse. It's rustic and unrefined, but it was an easy project for a beginner. Andrea from Cooking Books blog calls this "the one thing I've made all year that I'm most proud of" and says it was also the part of her wedding she obsessed most about. She gives tips on her blog about how she assembled the cake and added the fondant. You can see that she's a frequent and accomplished cook who regularly bakes, though she'd never taken on anything like this before. Can You Believe Her Wedding Cake Was Her First Fondant Cake? Another bride who made her own wedding cake is Nessie from Baking = Love blog. She writes, "I think this is one of my proudest baking achievements." What's even more impressive is that she'd never made a tiered cake nor worked with fondant before! As a New Zealander, her cake was a traditional fruitcake, covered in white chocolate ganache and fondant. She tied it into her Chinese banquet colors with a topper of red and white roses. Surprisingly, the fondant wasn't the hardest part - it was getting the ganache frosting smooth! But it all turned out beautifully in the end. Nicole Spiridakis tells NPR about her struggles in making two cakes for her brother's wedding. Though she details the many hours of work involved and discusses how frayed her nerves were, she finishes by saying, "Yet that night, as I looked around at the wedding guests cutting themselves enormous slices of chocolate cake and raving about the lemon curd, I felt a sense of joy no baked good I'd previously produced had elicited." This cake is more rustic and homemade looking, and the secret ingredient is love. Dedri from the blog "Look at What I Made" not only baked a three tier cake for a friend, but also made hand-crafted gumpaste roses to decorate it. If you're like me and like to read a lot of details on a project like this, she has a six-part guide to what she did from buying the tools to the finished assembly. Best of all, she links to the professional cake that inspired her. I find it so helpful to see the two cakes side by side. It could cause you to say, "It's worth the extra money to have perfection," or instead say, "This homemade wedding cake is beautiful! I'm going to make it myself." It's hard enough to make your first wedding cake, but it's harder still when it's for your own wedding. Then you have to squeeze in baking, frosting, and decorating in between the final dress fitting and the rehearsal dinner. Your nerves are also more likely to be on edge, so it might be harder to deal with anything that goes wrong. Yet as a baker, making your own wedding cake is very tempting. Especially when you see how expensive they are, it's hard not to say, "I could do that!" So Weijia from Dinner with Weijia did something smart: she baked a friend's wedding cake as practice for when she makes her own later this year. She had the real time constraints of an actual event, including figuring out how to transport everything across the state. Best of all, she really enjoyed herself while making it! When you're the editor of a major food blog and have authored cookbooks, your guests might expect you to just cater your whole wedding yourself. But Faith Durand (editor of thekitchn.com) and her husband realized their limitations and decided to just make their wedding cakes. The act of making and then serving cake to their guests symbolized hospitality to them, and just felt right. Yet since neither of them are bakers, they stuck to simple and rustic. In fact their cakes were so simple, they didn't even have any frosting! Yes, the cakes were either single layer lemon cakes, or a stack of tiered chocolate cakes with unsweetened whipped cream between them. There was no waiting for buttercream to stop being curdled, and no endless sifting of powdered sugar. Instead, there was plenty of time to relax, and the cakes were simple enough that good friends could jump in to assemble them while the bride got dressed. 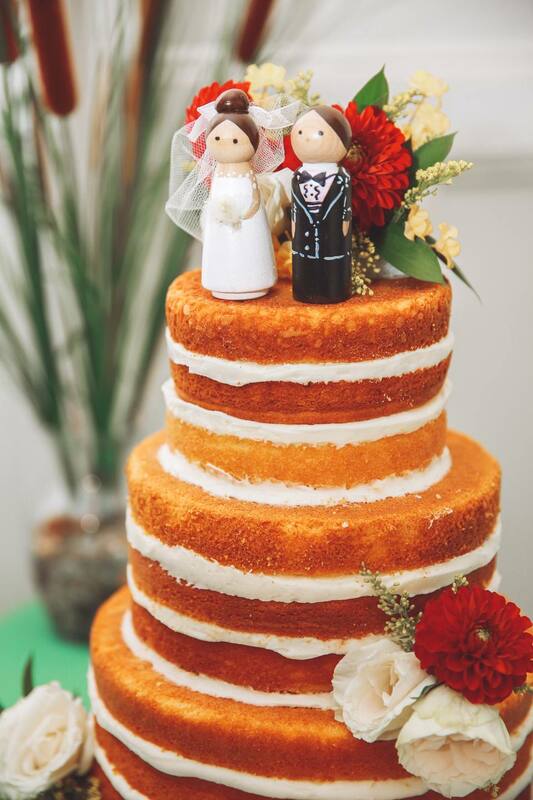 Read all about Faith's experiences in wedding cake baking. A Styrofoam Wedding Cake Makes Life Easier!